RSForm!Pro incorporates the possibility of creating various mappings within a local or external database. As these might come in help, you may also want to trigger specific mappings based on certain user selection for example. In order to do so, a PHP script will be used. When specifying your mappings, there is no particular way of naming each or these for an internal reference. However, we will differentiate between mappings based on their order. 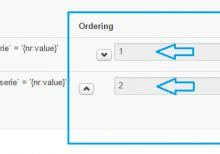 In the picture on the right you can notice the order your mappings have (example: order 1 will be mapping 1). Knowing which is which, an example will be provided. We want the first mapping (mapping 1) to trigger only when car was selected, while the second mapping (mapping 2) when plane was selected.